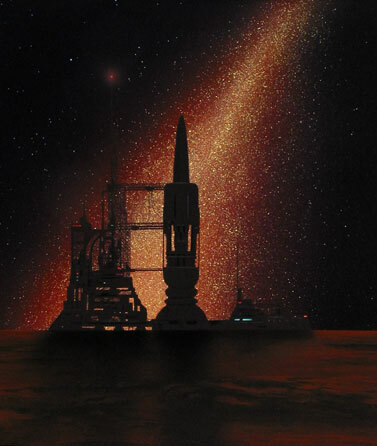 A gantry rises alongside a towering starship. In the distance, a brilliant galaxy looms skyward, illuminating the terrain. The nearby horizon and distant galaxy are juxtaposed to suggest the immensity of the void into which the ship is about to plunge. Matted in brown with a rust fillet and framed with an attractive glossy, black, rounded metal frame.